This home in Bellaire (Houston) received damage from flooding during Hurricane Harvey in August 2017. 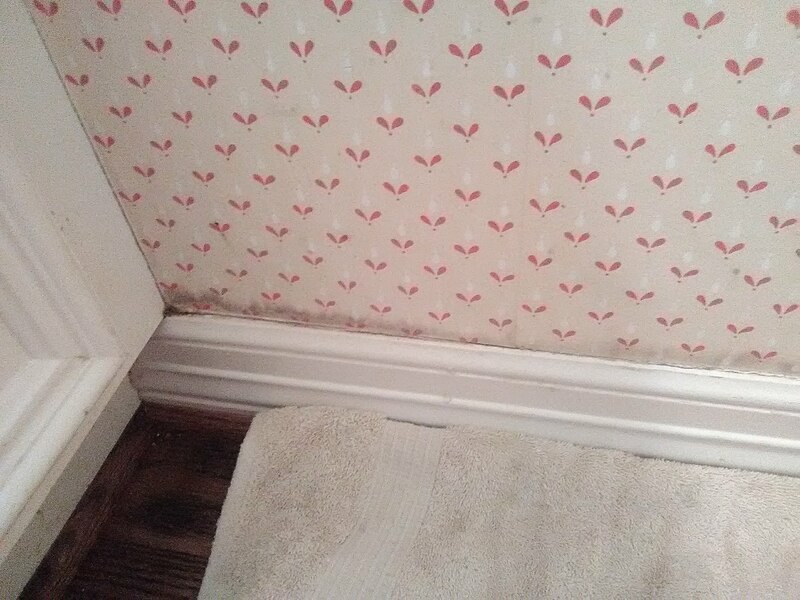 Water stains appeared on a small area of the wallpaper just above the baseboard in this powder room. 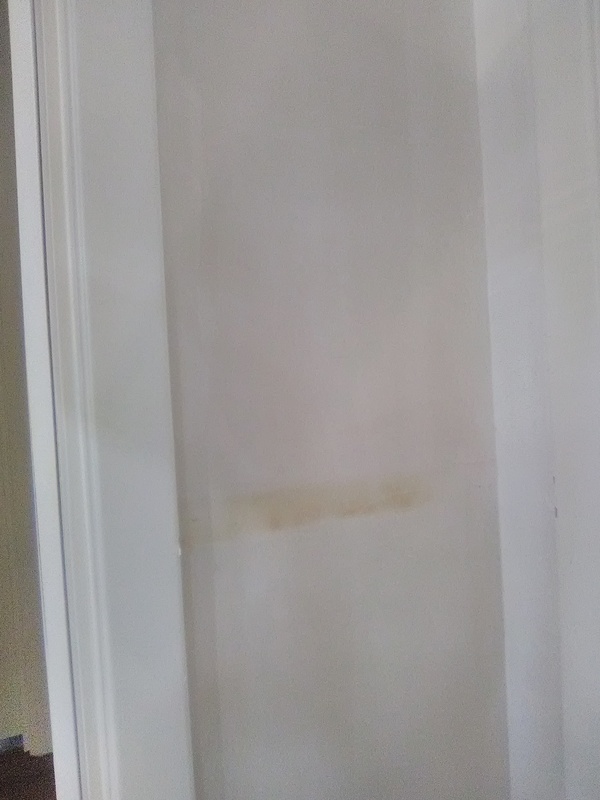 Luckily, the homeowners had saved the paper left over from the original install, so I had material to use for the repair. 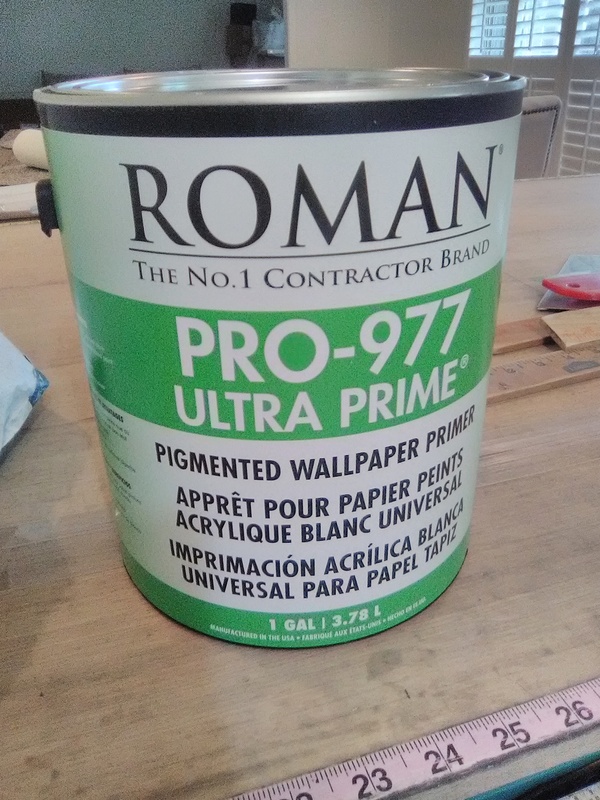 Certain substances, like grease, blood, smoke, rust, ink, tobacco, and water stains will bleed through wallpaper (and also paint and other materials, too). 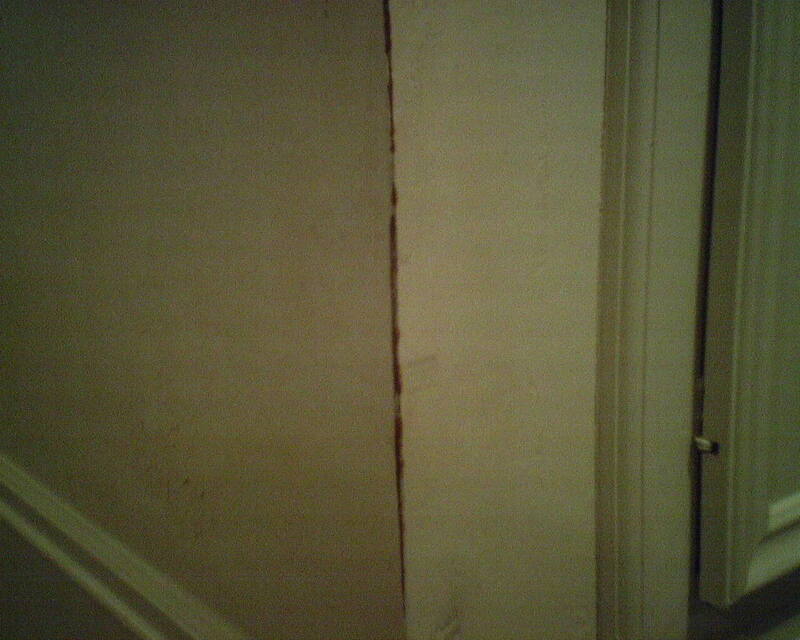 To prevent this, the discolorations must be treated with a stain-blocking sealer. 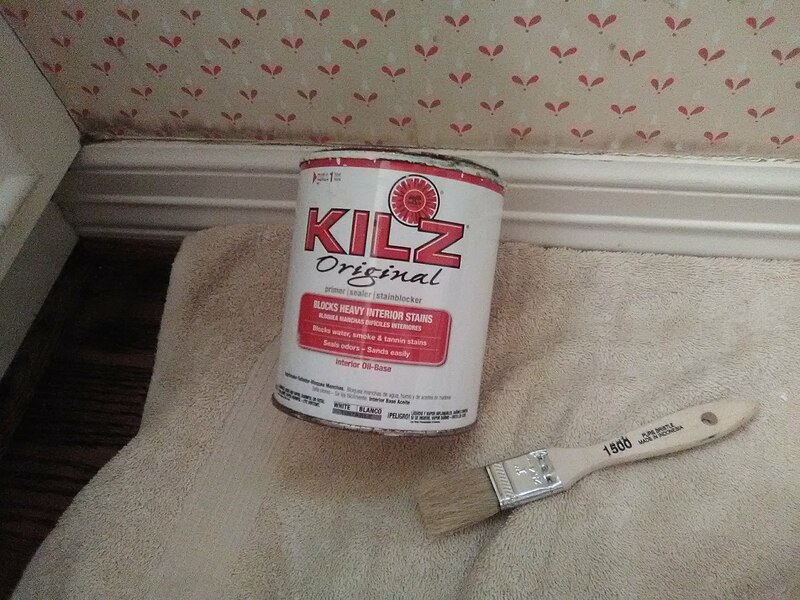 Many of these are shellac-based, such as BIN, made by Zinsser, but there are others. 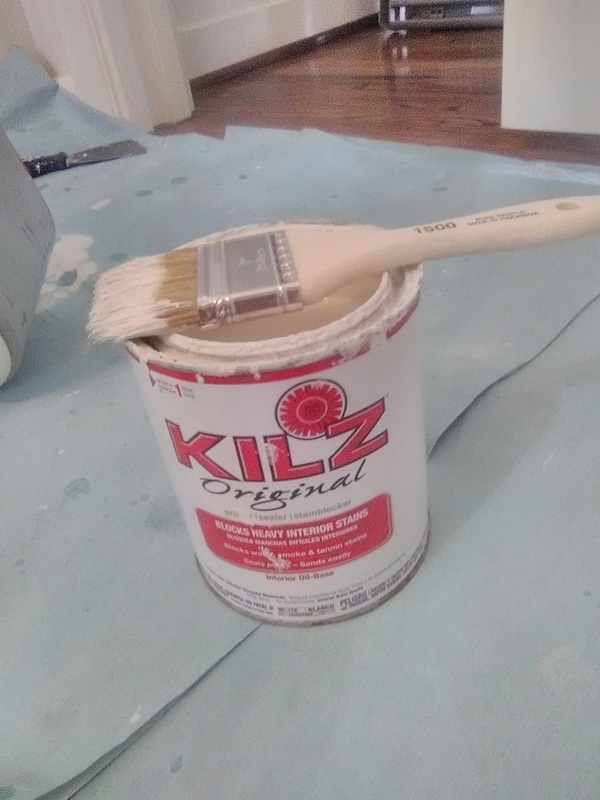 I prefer oil-based KILZ Original (2nd photo). 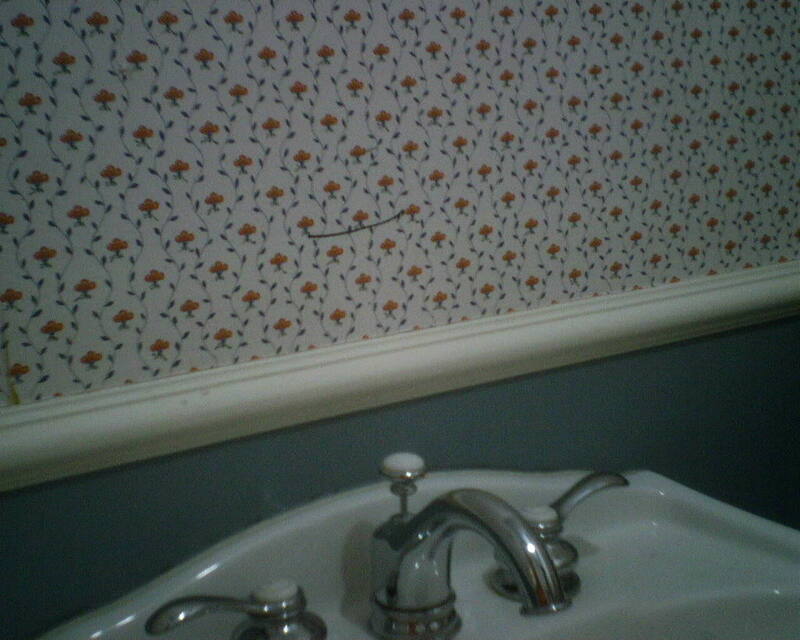 I could have just cut some wallpaper and slapped it on top of the stain. 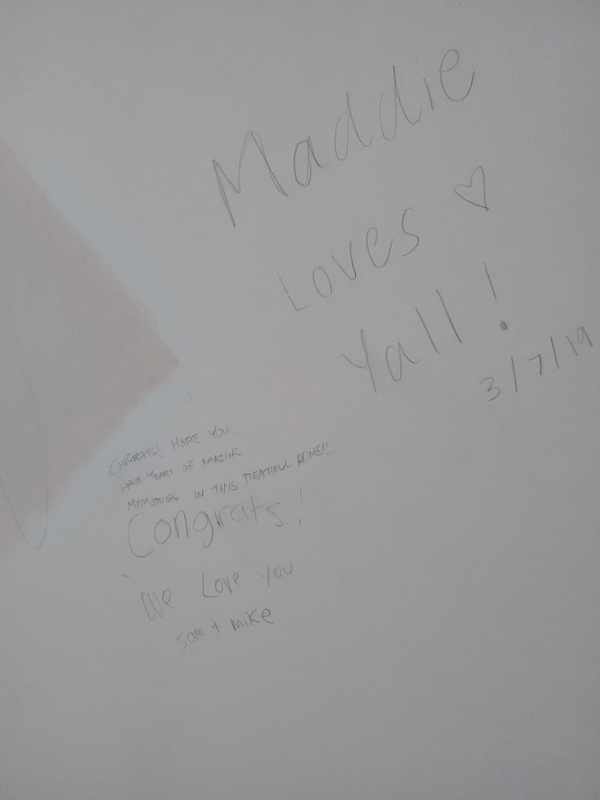 But I wanted to be sure these flood survivors wouldn’t have to look at water stains again. 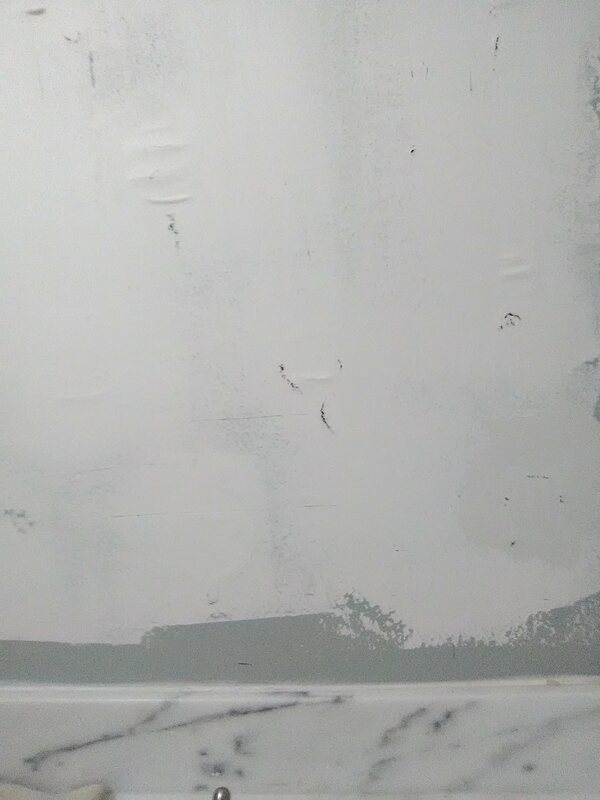 So I used KILZ to cover the stains (3rd photo). The next week, I came back to do the patch. 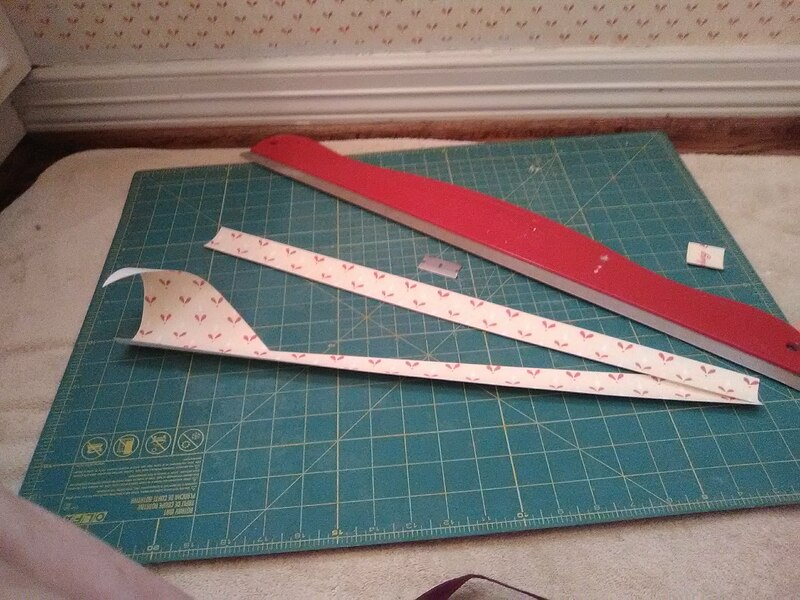 Using my self-healing craft cutting mat with angles and measurements to trim on, along with a straightedge and razor blade, I cut appliqués to paste on top of the stained paper. 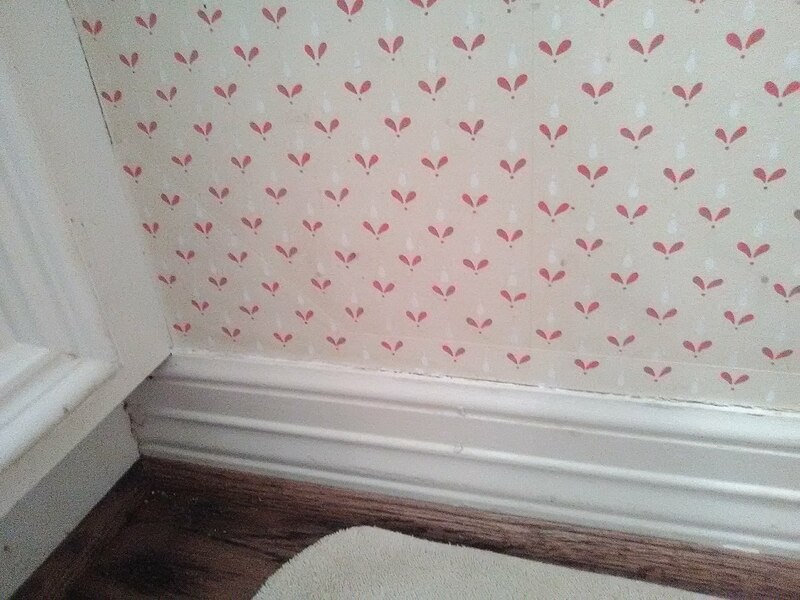 It wasn’t quite as simple as it sounds, because the wallpaper had to be hand-trimmed (use a razor blade to trim off the unprinted selvedge edge). 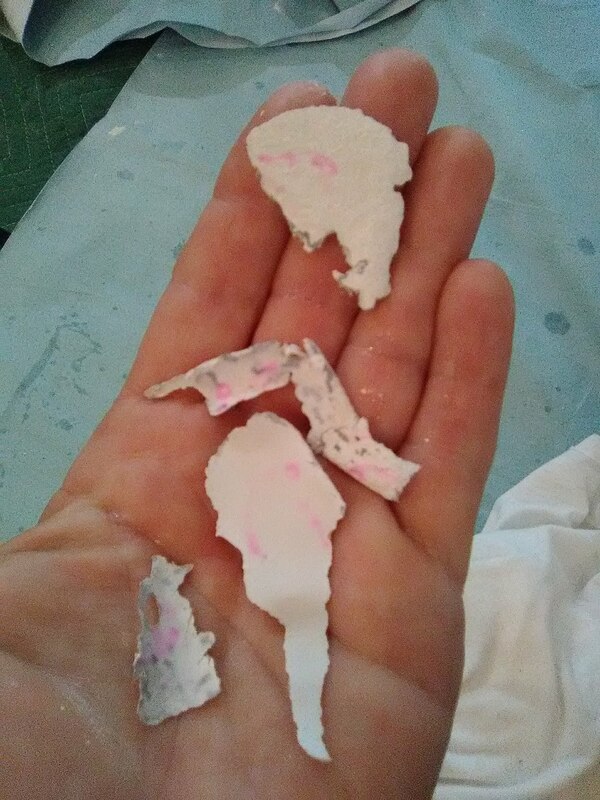 And pasting the paper causes it to absorb moisture and expand, which can throw off the pattern match. 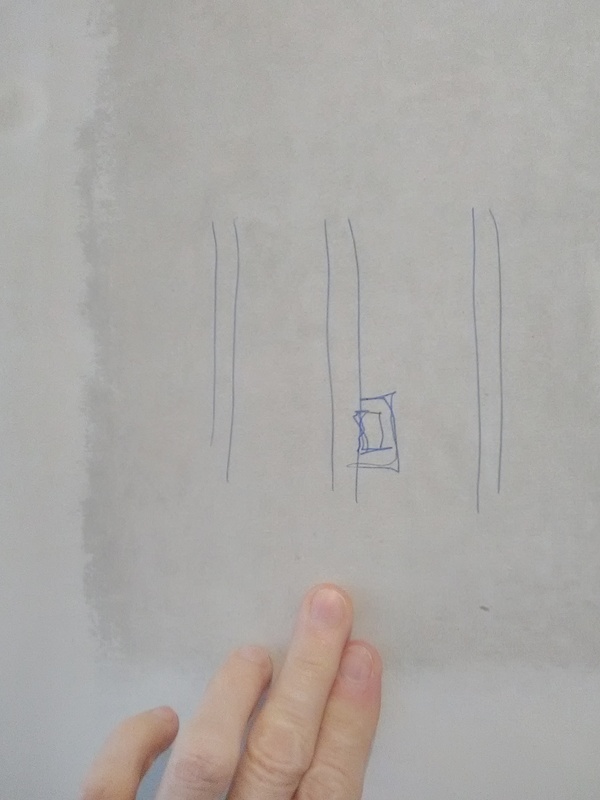 So I was dealing with factors relative to what the other guy did and the products he used, compared to my own techniques and products / paste. 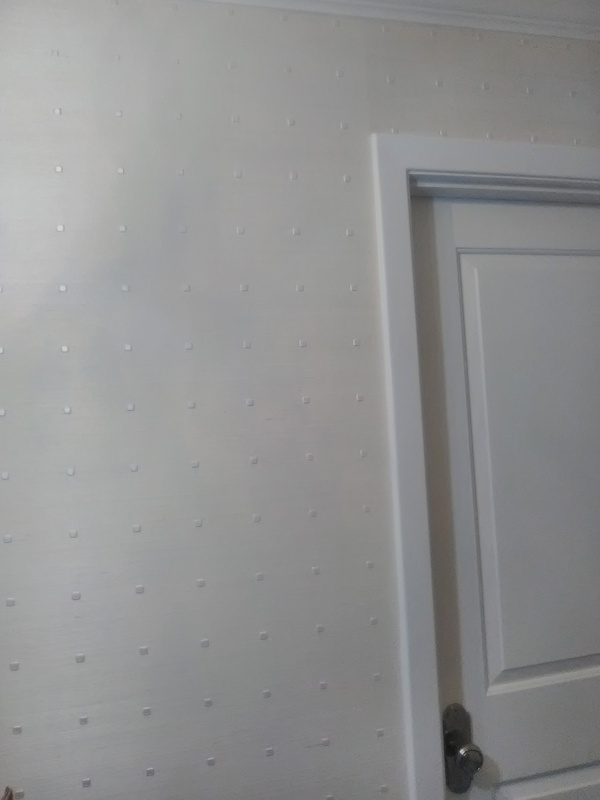 It took two tries, but with careful trimming and a little touch-up paint, the job turned out great (last photo). 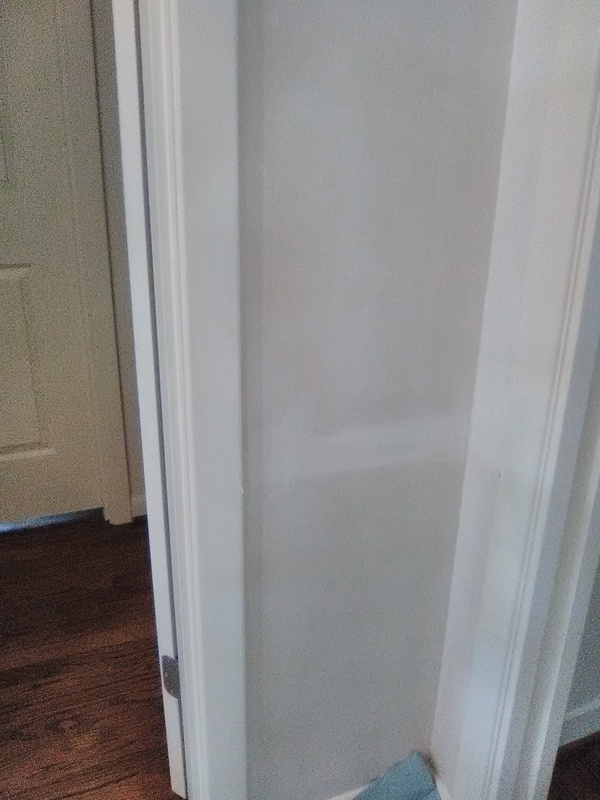 I also used paint to cover some stains at the top of the baseboard, and also re-pasted some loose areas in other parts of the room (no picture). 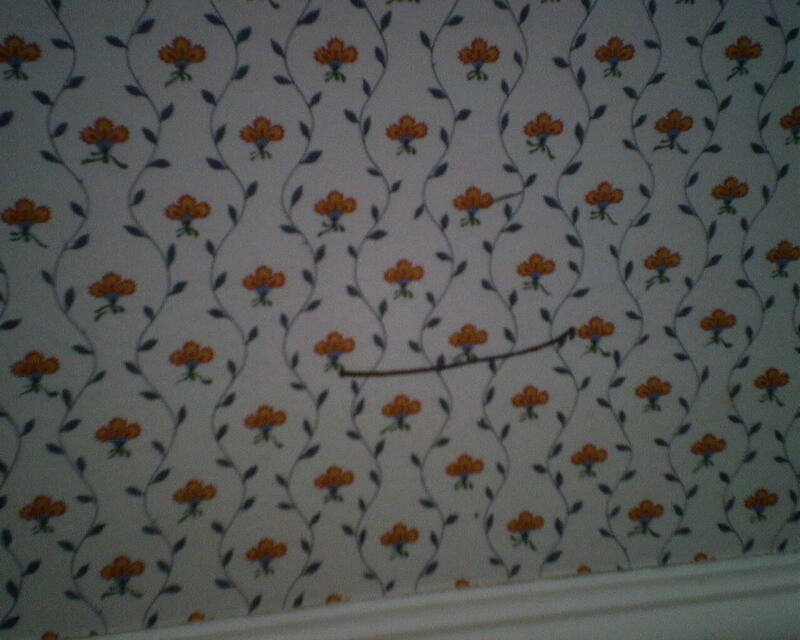 Don’t Write in Ink on the Wallpaper – or the Wall!! 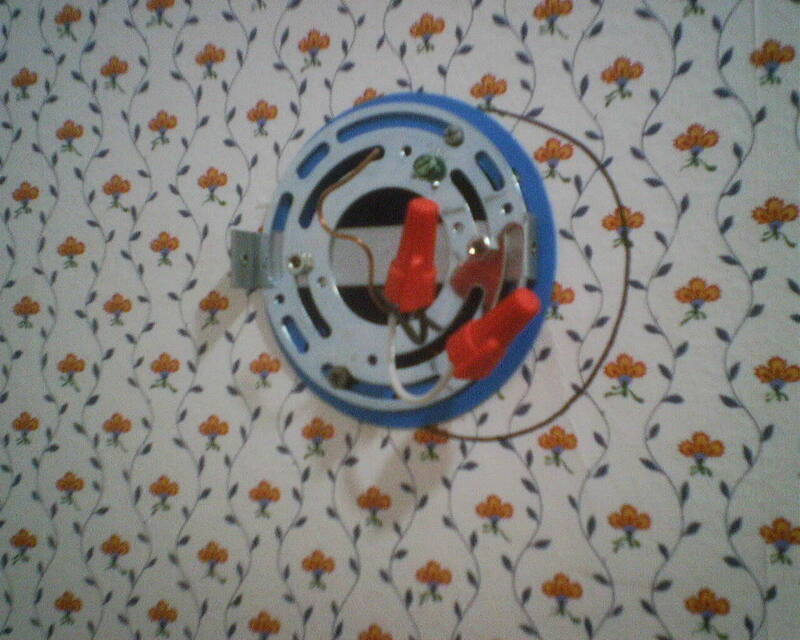 The contactor added wall light sconces on either side of the sink, and he also hung the heavy mirror. 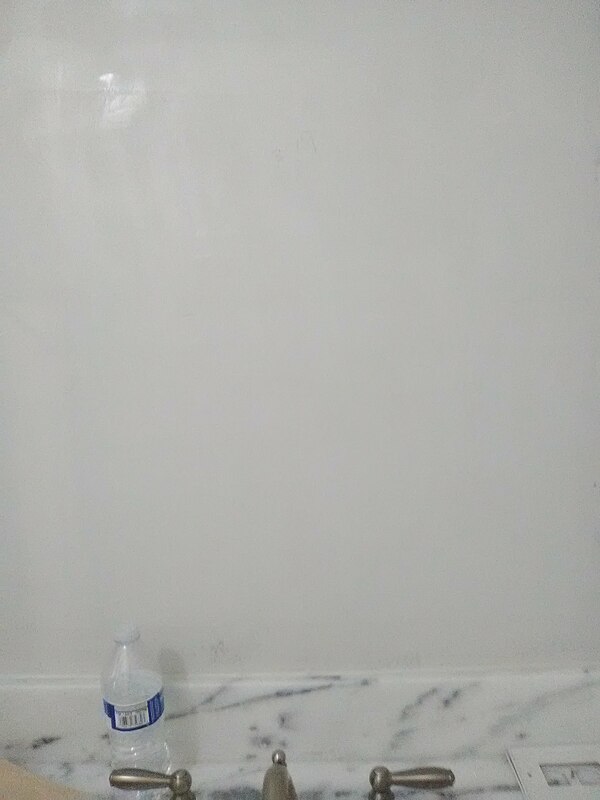 For some reason, he roughed in where these objects were to be placed by marking the walls with a Sharpie ink marker, or something similar. 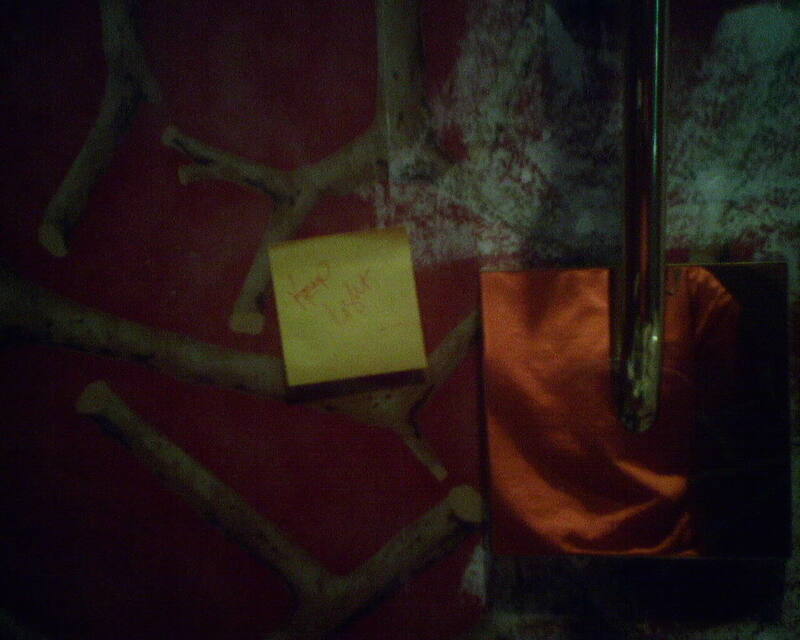 Folks – NEVER write on the wall with ink. 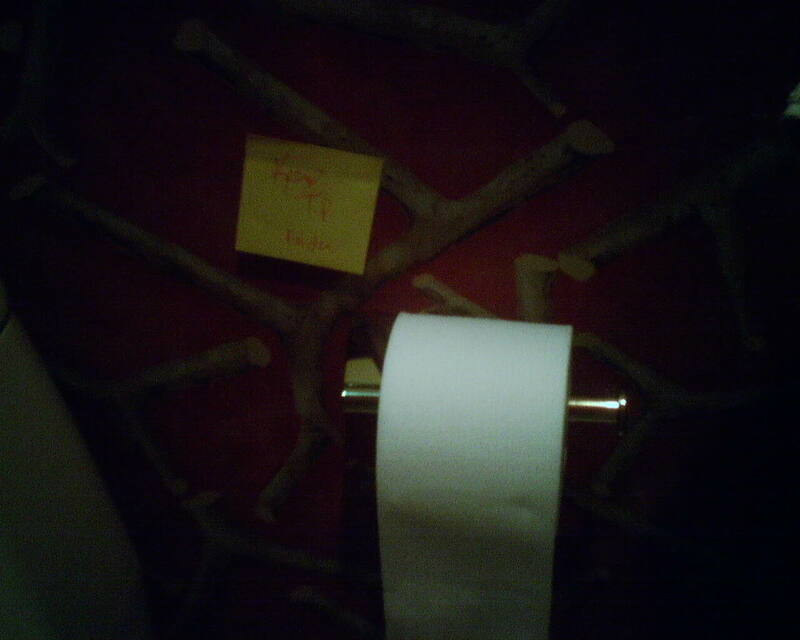 Nor with crayon, ballpoint pen, or the like. 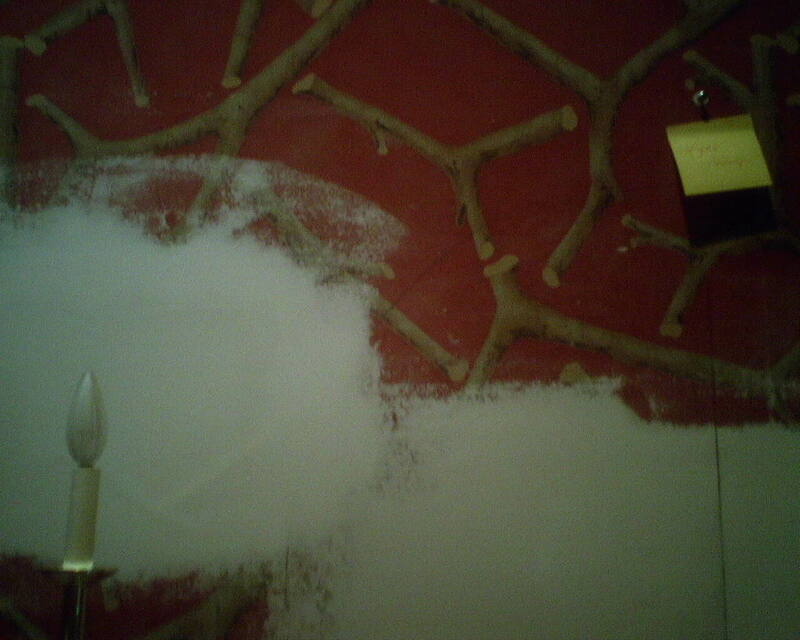 The substances will eventually work their way through the wallpaper (as well as paint, wall texture, or a myriad of other surfaces), and will end up looking like ghost shadows. 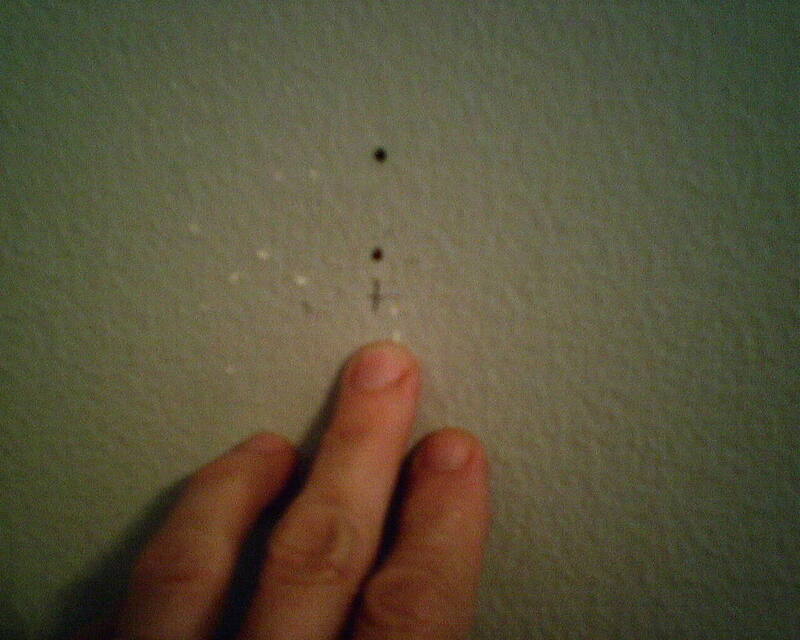 Pencil is OK, and so is a light snap from a chalk line. 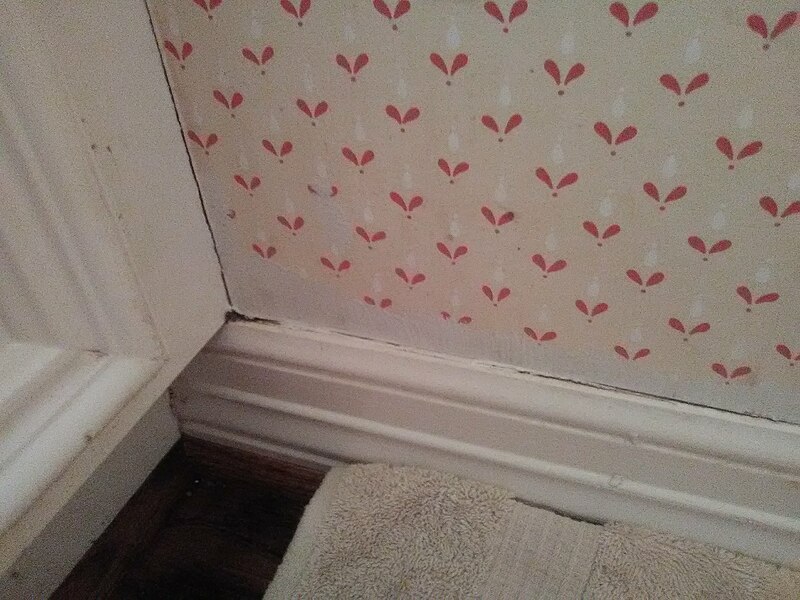 These materials won’t bleed through the new top layer of wallpaper. Before I start a job, I ask the homeowner if she is going to use the same towel bars, toilet paper holder, mirror, light fixtures, etc., or if she plans to replace them. 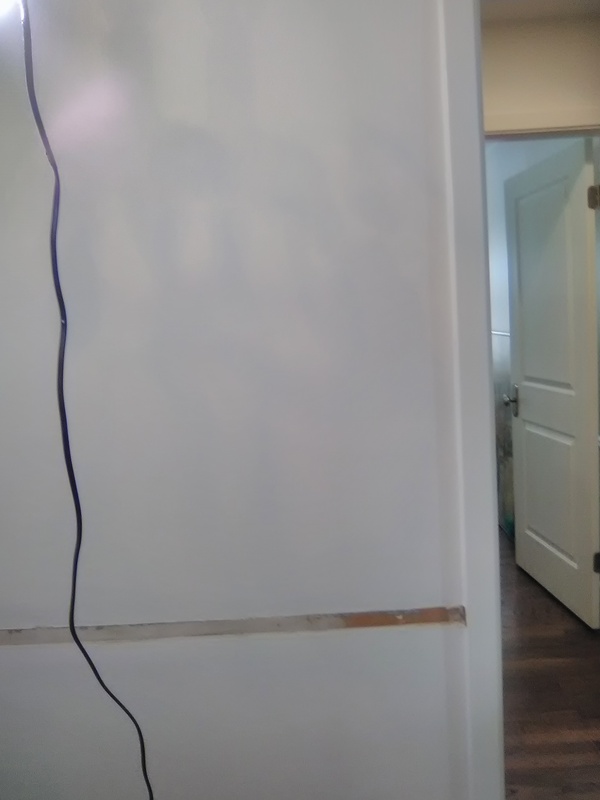 Then I know if I should save the mounting hardware and replace the fixtures, or if I should remove these things and fill in the holes in the wall.